So we all know that changing up our routine helps change our body and can get us out of our occasional rut. I read this article about dusting off the rowing machine at the gym. I used to row in college all the time but haven’t since then. I have been using the rower everyday this week and let me tell you…it kicks my a$$!! I set it for 500 meters and challenge myself to beat my best time. So far I am at 33 strokes and completed it in 2.05. The longest 2 minutes and 5 seconds of my life every day this week lol! Trying something new is always good for me and challenging myself is so much fun to me! Dust off your rower and have some fun! It works pretty much your whole body! I know I have told you several times about green tea but I am going to tell you once more to try it out! Green tea is calorie free as long as you add no sugar. It contains ECGC with is an antioxidant that reduces risk for cancer and heart disease. It also, revs your metabolism, which aids in your burning maximum calories! Two benefits in one. I know you might not love the taste but keep drinking it. It might grow on you like it has me. I crave it! 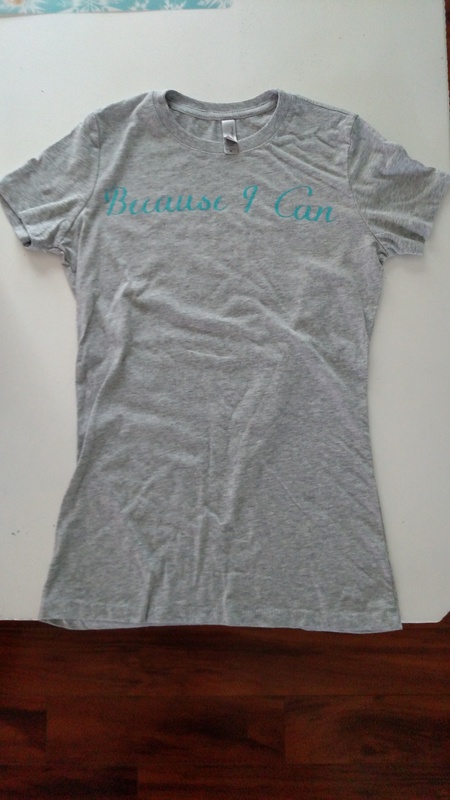 My favorite saying is “because you can” I had shirts made which will be available tomorrow! Can’t wait to share with my followers! That moment when you have to choose…do I continue my journey. Do I go left or right. For some its a decision they make in a minute for others it’s days, month or longer. When something negative in my life is going on the inner fat girl comes out. I have always turned to food. Food is comforting for me. I love to cook and bake! I believe food is love! So it’s extremely hard to not let that inner fat girl take over and sit and eat junk all day when I am feeling down! It take so much control to stay on my journey to not turn to food. To not skip out on the gym! No matter how long it takes you to decide please don’t judge yourself just move forward to be the healthiest person you can be! At the fork in the road always take the one to stay on your journey. Choosing the right path is one of the hardest things I have done in my life! It is a choice I make all day everyday! I drink at least one mug of 16 oz. of green tea steeped for 20 minutes everyday. I recently found a new type I really enjoy! I don’t know if it actually helps with energy and supporting dieting but it takes good to me! Check it out! I joined trivemarket.com and I love it that is where I got the tea but I am sure you can find it at your local stores! So all my life I have cared for someone! If I wasn’t caring for someone’s children then I was helping out at home! At the age of about 10 I started being a mother’s helper. My mother was diagnosed with cancer when I was in the 6th grade. I helped as much as I could and had to grow up faster than most kids my age. I am just a caregiver my nature. I have always given so much of myself to others that I forget about myself. I typically give too much! It took about 20 years but finally I needed to put myself at the top of the priority list. That is way too many years so please hear me when I say only good can come of you putting yourself at the top of the list of prioritites. I am the only one who can care for me the way I need it! I am the only person that can allow myself happiness and put myself in relationships and situations that will make me happy. I need to be cared for too! My journey began a couple of years ago when I started caring for myself by eating proper portions and eating healthier. I felt so good about making these changes and in turn began to make more changes for me. The gym came next and now I am a gym rat as you all know! Don’t wait to prioritize yourself! Don’t put everyone and everything else before you! I promise the laundry will be there when you get home from the gym! I promise you that your family will also benefit from your happiness! It is not selfish! If is ok to prioritize yourself! It’s ok to want to feel good! Feed your body right and make time for exercise and you will begin your journey! Once you have begun you will feel so much better! Be the best “you” that you can be! Please don’t wait like I did! Learn from my mistakes! Love yourself enough to make the changes you need to be your healthiest and best you! TELL YOURSELF YOU CAN! BECAUSE YOU CAN!! Have you been enjoying this beautiful weather? I paddle boarded this weekend for the first time this season and it reminded me how much I love being outside but getting a workout in! If you have not tried paddle boarding you have to! It’s so much fun and a wonderful workout! I admittedly will tell you that I am a gym rat. I don’t really workout outside often. I like the controlled environment at my gym:) No worries about the rain, wind, blaring sun or heat! Getting out of my norm is important though! I don’t want my workouts to become stale! So before the real summer heat comes I am going to try to enjoy more time outside! I am planning to run outside, flip tires outside at the gym and paddle board as much as possible. What workouts do you do outside? So like I have said a bunch of times…try something new! Do something you don’t normally do! You might love it! I cooked all afternoon yesterday and I can’t preach to you how helpful it is to me to have healthy food in the refrigerator at all times! It keeps me on track because my family doesn’t eat the same as me and making all these different meals can be a challenge! I breaded and baked eggplant to keep in refrig and had that tonight on top of a huge salad with fresh tomatoes and a little balsamic and cheese. I also made this veggie tartan and asparagus and potato salad. Don’t forget to follow me on pinterest!! Veggie Tartan-I sprayed pan with coconut oil spray and just drizzled veggies with evoo and sprinkled with a small amount of cheese. Hope you love it as much as I do!